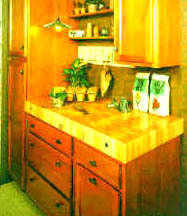 Maple Kitchen Islands, Counter Tops, Lyptus & Cherry Butcher Block, Walnut and Oak Counter Tops...On Sale! 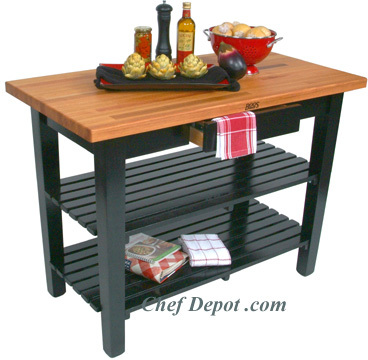 More images and butcher block styles are here. 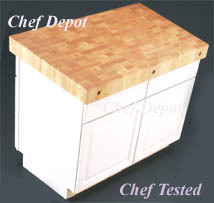 Solid Maple Butcher Block Counter Tops will enhance your kitchen! Our tops combine function with style, select solid maple, walnut, cherry, lyptus and red oak counter tops and table tops are very attractive. 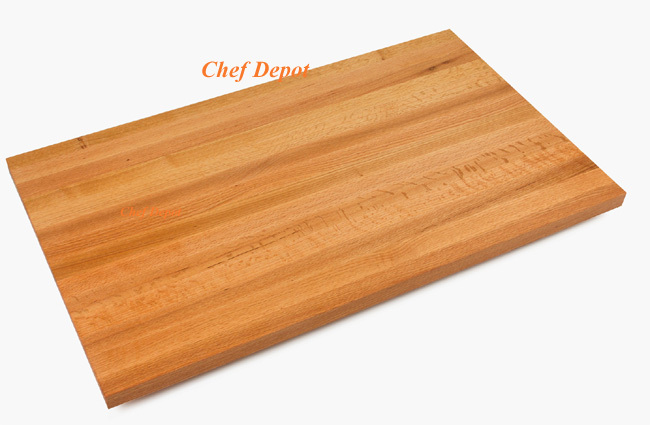 Demand the best for your kitchen, our NSF certified butcher block is Made in USA. 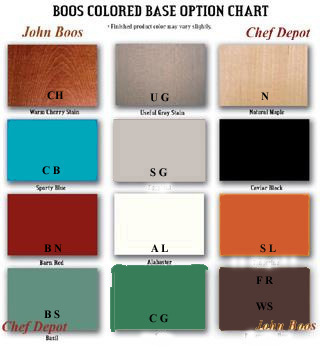 Top 10 reasons you should buy your John Boos Products from Chef Depot! Optional edges are here! Find a lower price on any John Boos Product, likely we will beat it! Free Shipping! Email us here for sizes and prices! 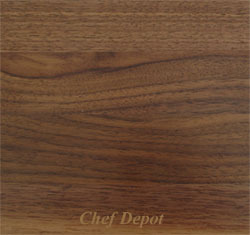 Our Blended American Walnut will add style and warmth to your kitchen. Ours are all made in the USA. Click here for popular sizes / prices! Choose food safe clear varnique finish, as pictured (or optional mineral oil). This finish is food safe, tough and durable! Choose from hundreds of available sizes, Great for office, kitchens and bathrooms. These are available in 1.5 in thickness! Call us for 2.25, 3 in. and thicker sizes. Samples are available below. Click here for many popular sizes and prices! Call for special sizes and prices or to order (630) 739-5200 Ask about our USA made sale! Our Blended American Walnut makes great counter tops or reface your kitchen island. Ours are all made in the USA. *** SUMMER SALE - Call and ask for the HOT DISCOUNT *** Phone(630)739-5200 *** Click here for popular sizes / prices! Choose food safe clear varnique finish, as pictured (or optional mineral oil). This finish is food safe, tough and durable! Choose from hundreds of available sizes, Great for office, kitchens and bathrooms. These are available in 1.5 in thickness! Call us for thicker sizes. Samples are available below. 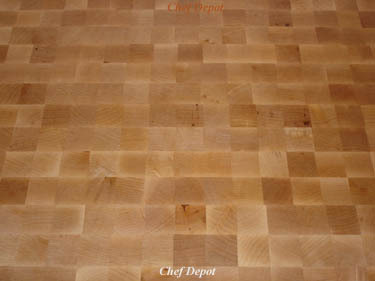 This is the Classic Blended Solid Rock Maple Edge Grain Kitchen Counter Top. You will love this counter top in your kitchen! These are available in 1.5 in thickness! Call us for thicker sizes. Great for bars, offices and kitchens. Samples are available below. Free Shipping in Cont. USA! Email us here for sizes and prices! Click here for popular sizes and prices! Call us to Check on your exact size! Several finishes are available. This center kitchen island features 3 in. thick Solid Maple (End Grain). Pictured with natural oil finish. We have many custom sizes, thicknesses and finishes to fit your new kitchen! Call one of our kitchen specialists to help with your kitchen remodels! Email us here with your size! 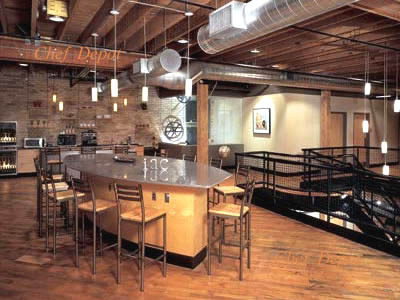 Call to order (630) 739-5200 We supply homeowners, builders and designers with kitchen counter tops & islands! We have hot new designs for your kitchen! This Rock Maple Island Top comes in 2 1/4 inch or 3 inch thick edge grain! Available with natural oil or food safe clear varnish finish. 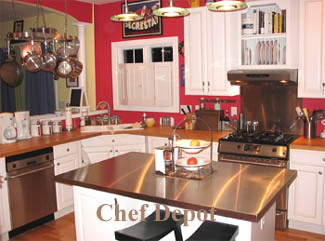 We have many standard sizes, custom and finishes to fit your new kitchen! 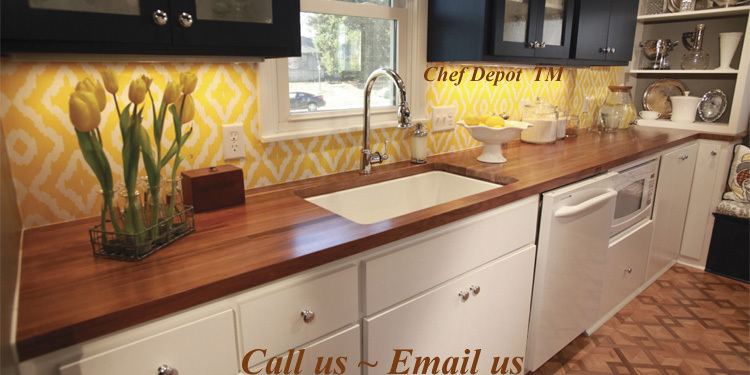 Call one of our kitchen specialists to help with your kitchen remodels! Call us with questions! We have Low Prices & Fast Delivery! Our customer choose the maple with food safe clear varnish finish. They have a nice new kitchen with lots of natural lighting. Highest Quality available, Made in the USA! We have many custom sizes, thicknesses and finishes to fit your remodel! Call one of our kitchen specialists to help with your kitchen remodels! Call to order (630) 739-5200 We have Low Prices & Fast Delivery! USA Made Quality! Our house stains offer a few more choices for you. These are done on a per quoted basis. They are finish sealed with a clear coat of Food Safe Varnish. We only offer these on some of our Maple tops. Highest Quality available, Made in the USA! Call for details and to order (630) 739-5200 We have Low Prices & Fast Delivery! USA Made Quality! This Maple Kitchen Island was created by starting with one of our 2 1/4 in. thick edge grain John Boos Butcher Block Tops! Available with natural oil or food safe clear varnish finish. We have many custom sizes, thicknesses and finishes to fit your new kitchen! 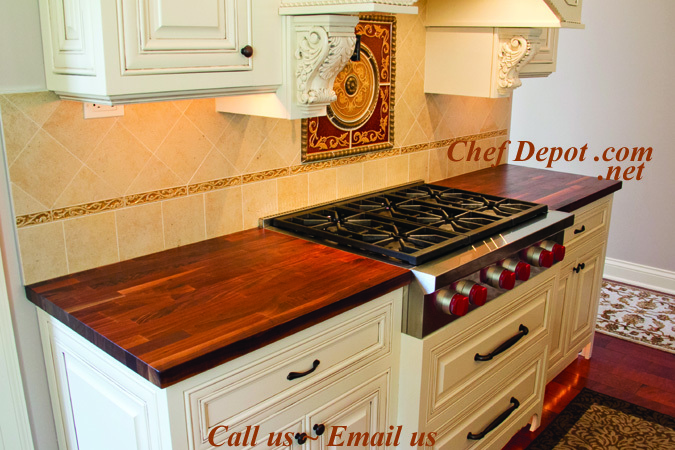 Call one of our kitchen specialists to help with your kitchen remodels! Our USA made Blended Cherry Table Top / Island Top features a nice smooth finish. Click here for popular sizes and prices! Our furniture quality top features a food safe clear varnique finish (or optional mineral oil). Choose from hundreds of available sizes, Great for a computer desk too. This gives you durability, ease of maintenance and beauty! These are available in 1.5 in thickness! 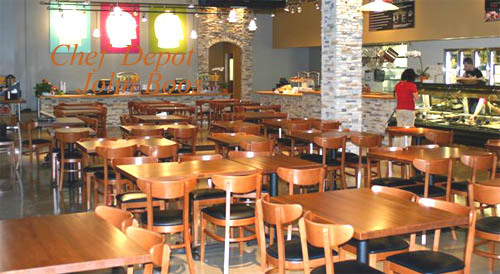 This Restaurant was remodeled with butcher block Countertops, Island Tops and Cherry Tables. Available with natural oil or food safe clear varnish finish. Highest Quality available, Made in the USA! This is select #1 grade Solid Rock Maple Edge Grain Kitchen Counter Top . You will love this counter top in your kitchen! Features full rails from end to end, USA made. Choose from mineral oil or clear varnique finish (both are food safe). Choose from hundreds of available sizes, Great for office, kitchens and bathrooms. These are available in 1.5 in thickness! Call us for thicker sizes. Samples are available below. Free Shipping in Cont. USA! Click here to order popular sizes and prices! This is our select #1 grade American Walnut Kitchen Counter Top . You will love this counter top in your kitchen! Features full rails from end to end, USA made. Choose from mineral oil or clear varnique finish (both are food safe). American Walnut makes great counter tops or resurface your kitchen island. Ours are all made in the USA. Click here for popular sizes and prices! Choose food safe clear varnique finish, as pictured (or optional mineral oil). This finish is food safe, tough and durable! Choose from hundreds of available sizes, Great for office, kitchens and bathrooms. These are available in 1.5 in thickness! Call us for thicker sizes. Samples are available below. 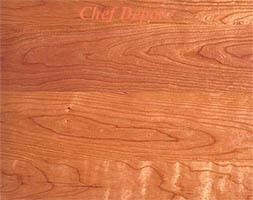 This is select #1 grade Solid Red Oak Edge Grain Kitchen Counter Top . You will love this Island Top / Counter Top in your kitchen! Features full rails from end to end, USA made. Choose from mineral oil or clear varnique finish (both are food safe). Choose from hundreds of available sizes, Great for the office, kitchens and bathrooms. These are available in 1.5 in thickness! Call us for custom sizes. Samples are available below. Email us here for special sizes and prices! This is our premium select #1 grade extra thick Solid Rock Maple Edge Grain Kitchen Counter Top. You will love this counter top in your kitchen! Features 2.25 or 3 in. thick, full rails from end to end, USA made. Choose from mineral oil or clear varnique finish (both are food safe). Choose from hundreds of available sizes, Great for office, kitchens and bathrooms. These are available in 1.5 in thickness! Call us for 2.25 or 3 in. thick sizes. Samples are available below. Our USA made Cherry Table Top / Island Top features a nice smooth finish. Call for special sizes and prices or to order (630) 739-5200 Ask about our Monthly Special Sale! Click here for popular sizes and prices! Our furniture quality top features a food safe clear varnique finish (or optional mineral oil). Choose from hundreds of available sizes. Also great for a bar or island top. This gives you durability, ease of maintenance and beauty! These are available in 1.5 in thickness! 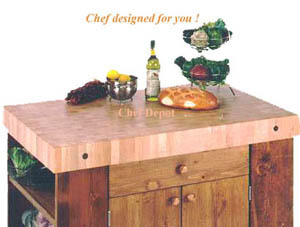 Another Classic Blended Solid Rock Maple Edge Grain Table - Island - Counter Top style. You will love this counter top in your kitchen! These are available in standard 1.5 inch thickness (order by clicking link). Call us for thicker sizes, 1.75 or 2.25 in. and others. Great for bars, offices and kitchens. Samples are available below. Free Shipping in Cont. USA! Email us here for custom sizes and prices! Click here for popular sizes and prices! This is a Solid Maple End Grain Kitchen Counter Top. Available with natural oil or food safe clear varnish finish. We have many custom sizes, thicknesses and finishes to fit your new kitchen! Call one of our kitchen specialists to help with your kitchen remodels! Call to order (630) 739-5200 ~ We can make and ship in 2 - 3 weeks! 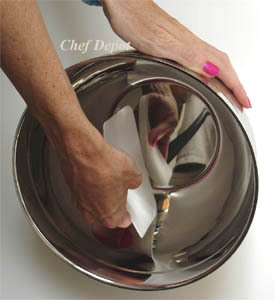 Our Chef Tested products are used by Gourmets, Chefs and pro Cooks! This is our Lyptus Edge Grain Counter Top (pictured with food safe varnique finish). It has the same rock hard properties as maple but it looks like cherry! We can make this top for you in many sizes, edge grain & end grain. You will love this counter top in your kitchen! Samples are available below. We can make and ship in 2 - 3 weeks! This is a Solid Rock Maple Edge Grain Kitchen Counter Top. You will love this counter top in your kitchen! Samples are available below. Call to order (630) 739-5200 Call us to Check on your exact size! Several finishes are available. Free Shipping in Cont. USA! Email us here for sizes and prices! Click here for classic sizes and prices! More Maple Edge Grain Kitchen Counter Tops. This is our American Cherry End Grain Counter Top (pictured with natural mineral oil finish). A few standard sizes are listed here. It is very hard and has similar properties to maple! We can make this top for you in many sizes, edge grain & end grain. You will love this counter top in your kitchen! We guarantee the best prices & We can make & ship in aprox. 3 - 4 weeks! Our American Walnut makes great counter tops or reface your kitchen island. Ours are all made in the USA. Click here for popular sizes / prices! Choose food safe clear varnique finish, as pictured (or optional mineral oil). This finish is food safe, tough and durable! Choose from hundreds of available sizes, Great for office, kitchens and bathrooms. These are available in 1.5 in thickness! Call us for 2.25 in and 3 in. and thicker sizes. Samples are available below. This is our American Walnut End Grain Counter Top (pictured with natural mineral oil finish). It has the same rock hard properties as maple! We can make this top for you in many sizes, edge grain & end grain. You will love this walnut counter top in your kitchen! We can make and ship in aprox. 3 - 4 weeks! This is our American Walnut End Grain Butcher Block (pictured with natural mineral oil finish). You get a base, we make the top! We can make this top for you in many sizes, edge grain & end grain. You will love a functional walnut island in your kitchen! Our Blended American Walnut makes great counter tops or reface your kitchen island. Ours are all made in the USA. Click here for popular sizes / prices! Choose food safe clear varnique finish, as pictured (or optional mineral oil). This finish is food safe, tough and durable! Choose from hundreds of available sizes, Great for office, kitchens and bathrooms. These are available in 1.5 in thickness! Call us for custom and thicker sizes (630) 739-5200. Samples are available below. This is our American Cherry End Grain Counter Top (pictured with natural mineral oil finish). A few standard sizes are listed here. It is very hard and has similar properties to maple! We can make this top for you in many sizes, edge grain & end grain. You will love this counter top in your kitchen! 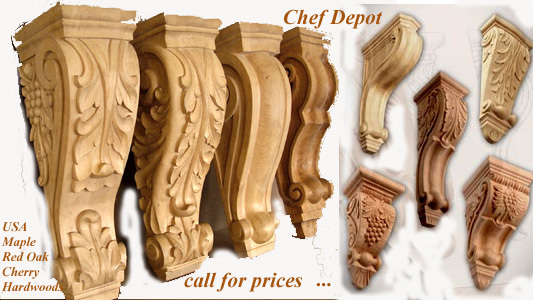 Call us for the best prices & We can make & ship in aprox. 3 - 4 weeks! This is our Rock Maple End Grain Counter Top (pictured with natural mineral oil finish). We can make this top for you in many sizes. 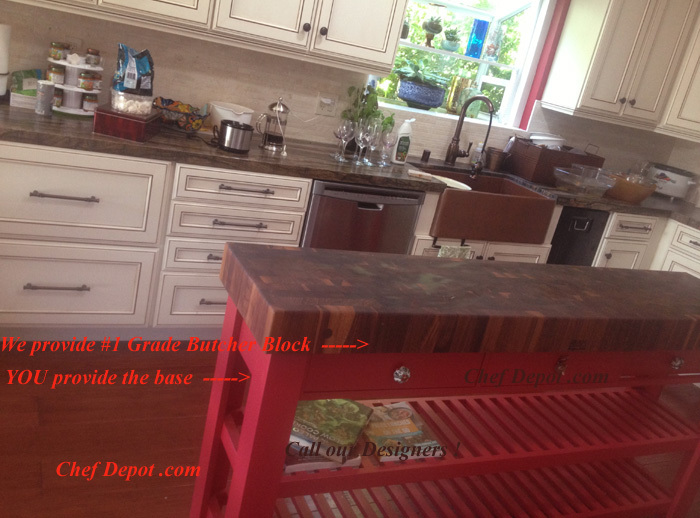 You will love this Butcher Block Island top in your kitchen! Makes and ideal chopping area next to your stove. Samples are available below. We can make and ship in aprox. 2 - 3 weeks! Email us here for sizes and prices! Many sizes are available here - Click Here! Call us for other sizes and discount prices. Our Solid Maple End Grain Kitchen Island Top is made from select End Grain Rock Maple. We can help you design a new island for your kitchen. You will love this island in your kitchen! Custom made just for you! Email Us - Click Here, or call us for sizes and prices! 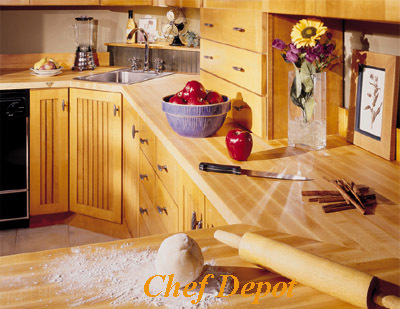 Call to order (630) 739-5200 Let us help you with your new kitchen island! Our USA made Stainless Steel Island Tops feature: Heavy duty 16ga thickness; high nickel content type 304 food service grade stainless steel (super pure and strong, will not rust, chip or pit). Available in several popular sizes for counters, Islands and tables. Underlayment: 1 1/2 in. thick premium MDF; Melamine backing, finished on all edges. This is a durable and stable wood core that can withstand years of heavy use. Click here for popular sizes / prices! Optional 4" Stainless steel backsplash material drilled for attachment to counter or the wall. A integral 6" boxed backsplash available on 25" widths only! Email us here for custom sizes and prices! This is our Lyptus End Grain Counter Top (pictured with natural mineral oil finish). Our custom kitchen island is topped with a John Boos Solid Rock Maple Kitchen Counter Top (Edge Grain). It is perfect for everyday use and entertaining. An island this size fits perfectly into most large kitchens. This island has lots of storage space built in below. You will love your new island and the extra counter space! This is our Lyptus Edge Grain Table Top. It is available round, square, rectangle and oval! It has the same rock hard properties as maple but it looks like cherry! Ours are made fresh, just for you. You will love this counter top in your kitchen! Samples are available below. Free Shipping in Cont USA! This is our Round Edge Grain Table Top. It is available round, square, octagon, rectangle and oval! It can be made in maple, oak, walnut and lyptus (cherry)! Ours are made fresh, just for you. You will love this table top in your kitchen! Click here for several sizes with pricing. Low prices & High Quality with Free Shipping! Our new American Cherry is a great choice for counter tops and kitchen islands. A magnificent example of USA quality and beauty. It features full length strips and is custom made just for you. Our furniture quality top features a food safe clear varnique (or optional mineral oil). This gives you durability, ease of maintenance and beauty! Available in 1.5 in., 2.25 in. and 3 in. thicknesses! Our new American Walnut is a great choice for counter tops and kitchen islands. A magnificent example of USA quality and beauty. It features full length strips and is custom made just for you. Our furniture quality top features a food safe clear varnique finish (or optional mineral oil). This gives you durability, ease of maintenance and beauty! Available in 1.5 in., 2.25 in. and 3 in. thicknesses! Our new 3 in. "Ogee edged Maple Island Top" is a magnificent example of quality and beauty. It features full length maple strips and it's completely custom made for you. Any shape you can imagine we will try to complete. The only significant restriction is the overall size. We can make this top up to 58 inches wide and 108 inches in length. Our furniture quality top features a clear varnish finish. This gives you durability, ease of maintenance and beauty! Our new 3 in. "Ogee edged Lyptus Island Top" is a magnificent example of quality and beauty. It features full length lyptus strips and it's completely custom made for you. Any shape you can imagine we will try to complete. The only significant restriction is the overall size. We can make this top up to 58 inches wide and 108 inches in length. Our furniture quality top features a clear varnish finish. This gives you durability, ease of maintenance and beauty! Our new 3 in. "Ogee edged Lyptus Island Top" is a fine example of quality and excellence. It features full length lyptus strips and it's completely custom made for you. Any shape you can imagine we will try to complete. The only significant restriction is the overall size. We can make this top up to 58 inches wide and 108 inches in length (even larger in 2 pcs.). Our furniture quality top features a clear varnish finish. This gives you durability, ease of maintenance and beauty! This is a Solid Rock Maple Kitchen Counter Top. The tops are all made from select #1 grade solid Rock Maple. Long strips running the length of the top (edge grain as pictured). Available with natural oil finish or food safe varnish. Many thicknesses are available. Sample pieces are available below! You will love this counter top in your kitchen! Click here for popular sizes and prices! More Solid Rock Maple Kitchen Counter Tops . This 4 in. 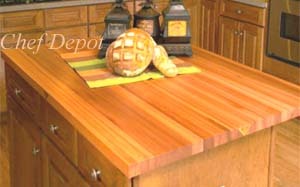 thick Solid Rock Maple End Grain kitchen counter top will add a whole new look to your kitchen counters. You will love this Butcher Block top in your kitchen! Many sizes are available. Call one of our kitchen counter specialists for more ideas! This custom kitchen features our Solid Rock Maple Kitchen Counter Top. The tops are all made from select #1 grade solid Rock Maple. Long strips running the length of the top (edge grain as pictured). Available with natural oil finish or food safe varnish. Many thicknesses are available. Sample pieces are available below! You will love this counter top in your kitchen! Click here for popular sizes and prices! This is a Ultra Premium grade solid Red Oak Kitchen Counter Top! Available with a natural oil or clear varnish finish. You will love this counter top in your kitchen! Classic Butcher Block Counter Tops are a great value, made from hard maple with rails of different length which are rich in defined grain and varied color. 1 1/2 in. thick, flat grain construction. These tops are an outstanding illustration of what the warmth of wood is all about! American Walnut Counter Tops and Island Tops offer a rich warm look. Made from select walnut with rails of different length which stagger the natural varied color. 1 1/2 in. thick, edge grain construction. These tops are perfect for a rich darker room with lots of wood! These are a great choice for a library, den or office too! 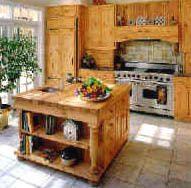 American Ash Counter Tops and Island Tops offer a rich warm look. Made from select ash rails with different lengths which stagger the natural varied color. 1 1/2 in. thick, edge grain construction. Light blond in hue with brown variations. Initially the variations can be quite dramatic, but the contrast will mellow and the variations will become more subtle as the block ages. With its neutrality, ash plays well in modern residential design. 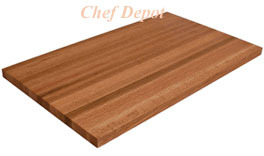 Ash countertops are a custom order and are available in a number of sizes and thicknesses. These are a great choice for a library, den or office too! 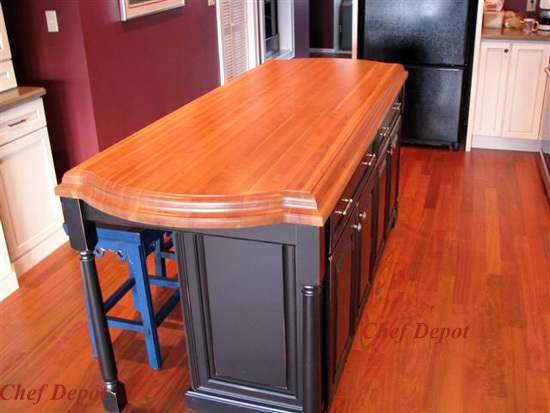 Click here for popular Walnut Island Tops, many sizes and prices! Our Stainless Steel Counter Tops feature: Heavy duty 16ga thickness; high nickel content type 304 food service grade stainless steel. Available in several popular sizes for counters, Islands and tables. Underlayment: 1 1/2 in. thick premium MDF; Melamine backing, finished on all edges. This is a durable and stable wood core that can withstand years of heavy use. Click here for popular sizes / prices! 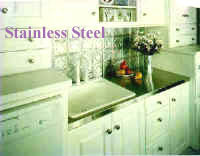 Optional 4" Stainless steel backsplash material drilled for attachment to counter or the wall. A integral 6" boxed backsplash available on 25" widths only! This is a Solid Rock Maple End Grain Kitchen Counter Top. It is finished with natural oil and is available in many sizes. You can change the thickness to raise or lower your current counter top or kitchen island. John Boos Portable Kitchen Carts - Click Here! Our Tables were featured in Bon Appetite Magazine (jan. 2010)! Call to order (630) 739-5200 These products are preferred by Chefs and Cooks all over the world! This is a Solid Rock Maple End Grain Center Island. It is 4 inches thick, finished with natural oil and is available in many sizes. You can change the thickness of the top or the base to raise or lower your new kitchen island. You will love your new kitchen center island! Portable Islands - Click Here! 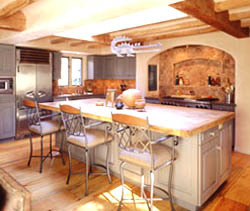 We can help you with kitchen remodel ideas! Call to order (630) 739-5200 Call Us to order! This is a Solid Rock Maple End Grain Counter Top. It is 4 inches thick, finished with natural oil or clear varnish and is available in many sizes. 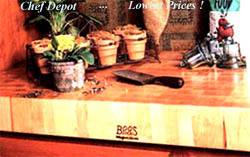 You can change the thickness of the top or the base to raise or lower your new chopping block. You deserve a new kitchen countertop! Chefs & Cooks shop here! Call to order (630) 739-5200 Call Us for a quote! 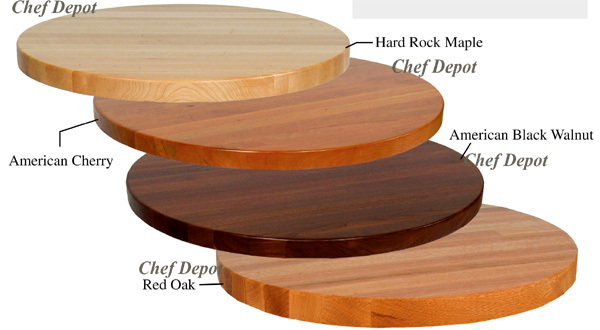 This is our Solid Rock Maple Sample Board. This is the perfect choice for kitchen counter tops and center islands. Click on Free Shipping at checkout! 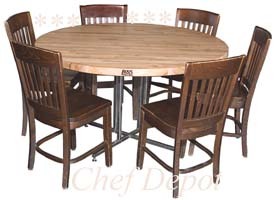 Great Chef Tables for your kitchen! This is our Solid American Cherry Sample Board. This is the perfect choice for kitchen counter tops and center islands. This is our Solid Lyptus Sample Board. This is the perfect choice for kitchen counter tops and center islands. This is our Solid Walnut Sample Board. This is the perfect choice for kitchen counter tops and center islands. This is our Solid Red Oak Sample Board. This is the perfect choice for desk tops, wine bars, kitchen, side bar and bath counter tops and center islands. Kitchen Island Tables, New Designs! This is a narrow Solid Rock Maple Edge Grain Kitchen Counter Top. These hard wood tops help reduce germs and bacteria growth naturally. NSF certified. You will love this counter top in your kitchen! Many other possible applications: Office Desk Top (use 2 drawer file cabinets for legs), Garage Work Bench Top, Laundry Room Table (cabinets below), ect... Free Shipping in most areas of USA! Click here - more customers dining rooms! Add amazing flavor to your cookies, Great Vanilla Extract! This USA made table is HOT. It features Solid Appalachian Red Oak with a natural beeswax wood cream finish. Pictured is our most popular size with 2 shelves and a drawer. The pictured table is 48 in. wide x 24 in. deep with a 1 1/2 inches thick top and sturdy black base, or choose your own base finish! You deserve a new kitchen work table! 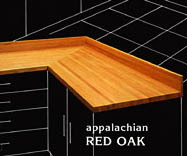 Appalachian Red Oak kitchen work tables - click here! 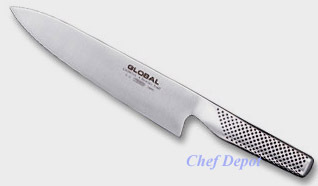 This is the new 6 inch blade Global Chef Knife, the most used knife, it easily glide through food! Each handmade knife is forged from super high quality Japanese alloy steel. It is very sharp and stays sharp longer. Lifetime Warranty. Chefs Note: Sweet Chef Knife, cool handle, razor sharp, super thin edge, perfectly balanced. A pleasure to use. If you want a high quality knife to pass through generations, you found it. Bonus: Free Offers Above & Below! Chef Notes: We like the feel of this beauty and the extra sharp thin blade. Global knives are made from the finest high carbon stainless steel available for producing professional quality kitchen knives. Yoshikin uses its own proprietary stainless steel which it calls CROMOVA 18 Stainless Steel. This steel is hard enough for Global knives to keep their edge for a long time. The CRO in CROMOVA 18 stands for chromium and the 18 is the percentage of chromium in the steel. The MO and VA in CROMOVA 18 stand for molybdenum and vanadium. These two elements give a knife good edge retention. This is a Solid Rock Maple Edge Grain Prep Board. These fit prep cabinets, kitchen galleys and more. These come in 8 in., 10 in., 12 in. widths and most any length. Call us, these ship only to USA! Email us here for sizes and prices! Click here for classic sizes and prices! More Maple Edge Grain Kitchen Counter Tops. Our non stick tongs are comfortable, lightweight and easy to use! These will work for flipping foods on the BBQ or turning items in non stick frying pans. 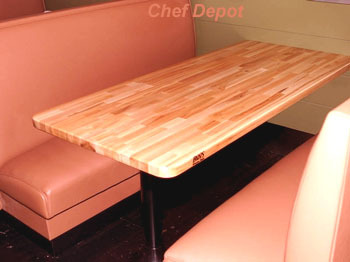 Click Here for more Chef Designed Tables! 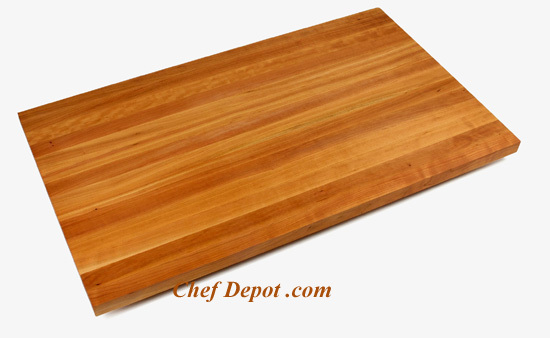 More images and butcher block styles are here. Click the green arrow on the right for more Maple Tables! High Quality, made in USA & Free Shipping!